Dueling Scenarios Revisited - The following commentary is a follow-up to http://www.greenfaucet.com/... First, again I would like to make clear that I do not consider myself a trader or credentialed technician (chartist) and I prefer to focus on the longer term. But, as I stated in the referenced commentary above which I wrote two weeks ago, it appears that one of two patterns is emerging, and depending on which one prevails, it could determine how you should position your portfolio over the next few years. Starting with the price of gold, it did in fact run quite quickly to $925/oz. before selling off to its breakout price, just above $875/oz. As I write this, gold is sharply once again up in an overall down market, but finding stiff resistance at $925. A close above $930/oz. would signal another “buy signal” on the expectation that the March 2008 highs (over $1000/oz.) would be challenged in short order. Goldbugs should be mindful that the a sustained rally is not “in the clear” and a close below $880/oz. would call into question this “pennant breakout” of which a growing chorus of traders remind us in the financial media. As one who is long gold, I would have preferred to have seen the breach of the pennant occur on lower sentiment indicators (too much positive sentiment). But things tend not to play out exactly to script. Regarding the popular averages last week's S&P 500 move above 850, it can be characterized as nothing more than a false breakout. As I write this, the average is making another attempt to pierce through the 850-level. A failure to make it through this time, or even worse, a “lower high” would be bearish and likely set the stage for a move back down toward 800. I don't like tests that fail. A failure for gold to move through 925 coinciding with the S&P 500 stalling at 850 would call into question an “intermediate term reflation trade” and lend support to the “resumption of the meltdown”. Read below to see why my money is still on the reflation trade. A chart of the Dow Jones Industrial Average dating back to the 19th Century strongly suggests that we have completed the fifth and final wave of a major up-cycle. The two down waves, the second and fourth of the five-wave cycle, occurred in the 1930s and 1970s, respectively. A downward “A-B-C chart pattern” tends to occur after a fifth major up wave has completed. The first “A-wave” seems to have been marked by the move from the highs registered in October 2007 to the lows in November of 2008. If the “A-B-C pattern” is to unfold as expected, then we should expect a counter-trend “B-wave” up- rally before the final “C-wave” down occurs. The “final C” should exceed the previous lows established by the first “A-wave” down. C-waves have a tendency to drop all of the way back to where the major fifth-wave began. That would mean that the DJIA could retrace all of the gains of the last 30 years and dip all of the way back down to 1000-level. Here, I wish to emphasize that a dip to that level is possible, but is not a certainty. For those who are quick to reject this “Elliott Wave Analysis” I would suggest that you reconsider. I know for a fact that institutional investors who manage billions of dollars pay very careful attention to these chart patterns (among many other technical indicators). Turning away from technical analysis and back to fundamentals for a moment, the evidence for strong and sustainable rally is forming. Please note that most who “buy-into”/participate in the anticipated rally are not thinking “B-wave rally coming”, rather they will be convinced that “the bottom” has been reached and that they do not want to miss out on the start of the next bull market. Otherwise, if everyone were thinking that the rally was not long term in nature, then they would be quick to exit and the rally would never get off of the ground. This likely explains why the expected B-wave rally is so delayed in occurring. But now with money being thrown around like confetti – 2 trillion to bailout the banks and one trillion for our politicians' favorite pet projects, all in the name of stimulus – bond yields are moving higher once again with the yield-curve is steepening. The Baltic dry freight index, the price of oil, gold, grains, and other commodities are all moving sharply higher, bouncing off their November lows. The dashboard indicators are turning bullish as Wall Street eagerly awaits the next banking bailout plan, destined to achieve the same miserable fait as the preceding ones. Misplaced optimism appears poised to rear its gullible head once again and will likely lure the trillions of dollars parked in the bond market and short-term money market accounts out their safe harbor and into the inferno of money hell again in the form of a bear market rally. I think it is safe to conclude that stunted growth and higher-bond yields are quite bearish and set the stage for the final “C-Wave” down. This is not “priced-in” as the perma-bulls continue to wrongly and tirelessly assert. Perhaps one of the most compelling longer-term charts which I use to confirm my fundamental analysis is the one provided by www.sharelynx.com below. 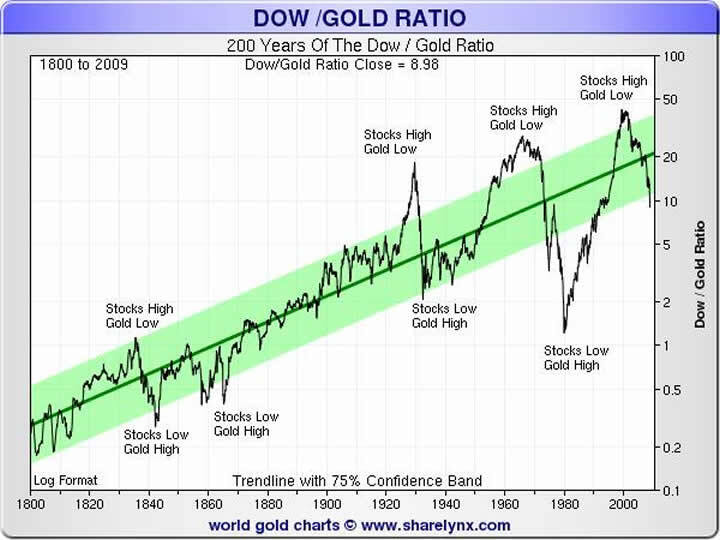 In a nutshell this chart suggests that since the establishment of the Federal Reserve almost a century ago, they have enjoyed success and failure in reflating the economy: success as indicated when the Dow/Gold ratio is moving higher and failure when it is moving lower. You can see the relative stability of the relationship dating back to 1800 up until the 1920s. You can also see the pattern of a megaphone forming shortly after the formation of the Fed. Extending the line forming the bottom of the megaphone, we can expect the Dow/Gold ratio drop to somewhere between 0.5:1 and 1:1 before turning up again. This would undoubtedly wreak further havoc on an already broken world fiat currency regime as money flees treauries and equities and flocks into gold. Would it not be poetic justice were a moumnetal change in the world's monetary system to occur on the 100 th anniversary of the creation of the Federal Reserve in 2013? The torrent of dollars unleashed by the U.S. trade deficit fueled ever larger bubbles around the world as credit expanded without limit. A crisis too big to be inflated away has inevitably arrived. Why is the global economy in danger of collapse? So far explanations have focused on the proximate causes, like banks' imprudent mortgage lending and use of complex financial instruments. But behind these missteps lie deeper problems with the world's financial system, flaws that made a crisis of this magnitude inevitable. The Austrian School of Economics has long warned of the dangers of fiat money and excessive government spending. Their warnings were mostly ignored in the Anglo-Saxon world. The 37-year experiment in fiat money and floating exchange rates has just come to a disastrous end. The lesson that policy makers must learn from that experiment is that “free market” capitalism under a paper money regime does not produce the same benefits as true free market capitalism (free from government-created money) does under a gold standard. Instead, it corrupts or overwhelms a country's institutions and regulators, and ultimately ends in catastrophe. (1) Displacement: Some change in economic circumstances creates new and profitable opportunities. (2) Euphoria, or overtrading: A feedback process sets in whereby expectation of rising profits leads to rapid growth in asset prices. (3) Mania, or bubble: The prospect of easy capital gains attracts first-time investors and swindlers eager to mulct them of their money. (4) Distress: The insiders discern that profits cannot possibly justify the now exorbitant price of the assets and begin to take profits by selling. (5) Revulsion, or discredit: As asset prices fall, the outsiders stampede for the exits, causing the bubble to burst. The key point is that without easy credit creation a true bubble cannot occur. That is why so many bubbles have their origins in the sins of omission and commission of central banks. Perhaps the economists desperately trying to apply the stimulus to economies around the world will succeed through a brew of supply-side and Keynesian solutions. We continue to place our trust in their expertise and ‘experiments'. So far their efforts have resulted in one disappointment after another. I tend to agree with Richard Duncan – “a crisis too big to inflate away has inevitably arrived”. Whenever I see the Treasury Secretary, Federal Reserve Chairman, or official economic spokesmen (in both the Bush and Obama administrations) boldly advcocate their plan, I am reminded of the phrase "The best-laid plans of mice and men/often go awry." Democracies around the world are demanding action, with riots occurring in places you would have never imagined. Government officials and politicians are not going to sit idlely by and allow the free market to work, despite the fact that their solutions will likely inflict more harm. You can rest assured that we are going to test the limits of government debt in addressing our financial and economic travails, as professors Rogoff and Reinhart caution us.